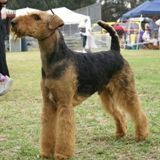 Bang "Best in Show at Airedale Terrier Club of Victoria Championship Show" is a spectacular dog who is winning major group and show awards. Several best in Show all breeeds and as many runner up best in show in a very short career. His immediate impact illuminates him clearly as of "THE KING OF TERRIERS". Bang is indeed a "royal" standout when he is not being court jester. Sired by our wonderful English dog imported as an American Champion and from the highly acclaimed Tjuringa female line behind him he exhibits all the qualities of the true champion that he is. Since this campaign began in March 2006 he is very rarely ever beaten in the breed and always impressing in group. Ch Tjuringa Firecracker, BANG, returns substance, power, soundness and rich colour to the breed. His great head is enhanced by correct ear carriage and a very dark eye. His elegant neck runs perfectly into a strong level back supported by exceptional angulation at both ends. His strong tight feet propel him soundly with long powerful strides. The stunning tail stamps true quality on this exciting young dog. After his magnificent three best in Group in successive shows and twice Runner up to Best in Show he was rested due to our overseas trip in July August September. 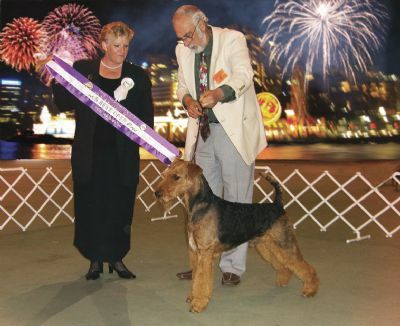 Then just a couple of weeks into October he was Australia's number one Airedale and had two best in show all breeds and another runner up. Clearly the most successful Airedale we have ever exhibited. 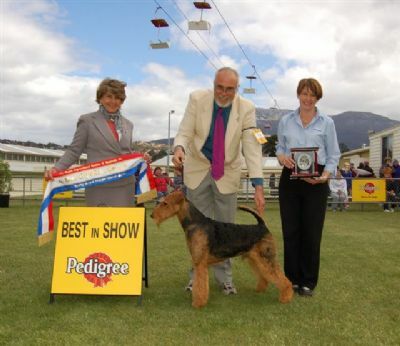 For details of show successes check him out on the 2006 Pointscore Pages where Bang finished number one Airedale in Australia. We are delighted to advise his hip score is 3:1=4. Bang is available at stud and will be shown occassionally throughout 2008.